Happy New Year to everyone, it's a bit late to wish, we were on a vacation in Dubai and after coming back to India, was a little sick, could make a post only today. May this New Year give all my friends and followers the best of health and happiness. I would have loved to start the year with a sweet dish, but couldn't make it, so, today's post is soft and spongy Appams, I had made it sometime back along with Vegetable Stew ( recipe to follow ). We use two varieties of rice and a little urad dal, and the ground batter is fermented with a little toddy, but I haven't used toddy here, I have just added some coconut while grinding. In other versions, cooked rice is added while grinding the batter, and yeast is also used I am going to try them soon. I usually serve it with sweetened coconut milk or with the vegetable stew but it tastes good with kurma, vada curry or even with some coconut chutney too..
Wash and soak both the rice and the fenugreek seeds for 4 to 5 hours. Then grind them into a smooth paste along with grated coconut, add the salt and mix it nicely with your hand and leave it to ferment overnight. The batter should be a like a thin crepe batter, you can add the coconut water to bring it to the desired consistency, then add the baking powder and mix it well. Heat a appam pan or a shallow pan like the one shown in the picture, pour a laddle of batter, swirl the pan to spread the batter, cover and cook till you see it browning at the edges, remove and serve it warm. I have used the blender to grind, so I grinded the idli rice and fenugreek seeds first, then the raw rice and coconut. 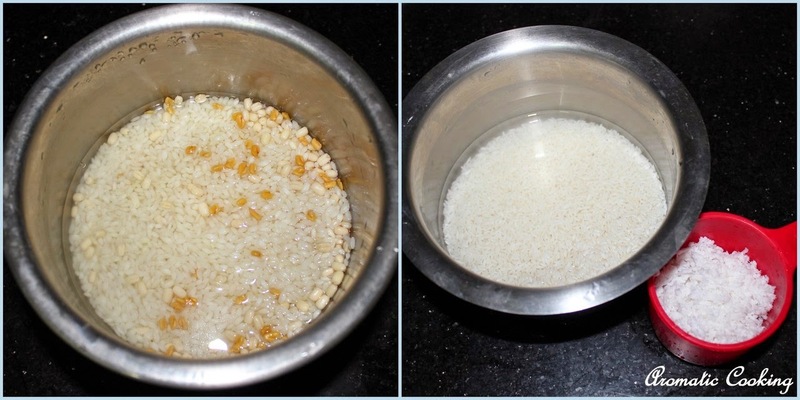 You can use par boiled rice in the place of idli rice. Adding coconut water is optional, if you don't have fresh coconut water, can add plain water. I have used a non-stick appam pan, so I just wiped it with a oiled napkin, also keep the heat low, otherwise you'll not be able to swirl, the batter will be cooked in the bottom very fast. 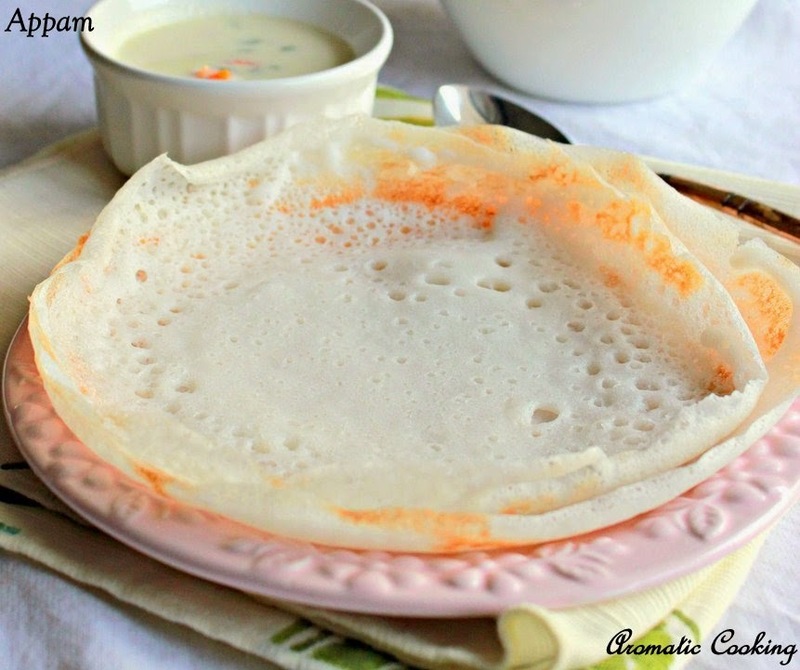 The appam should have the small holes, that shows the batter has fermented. 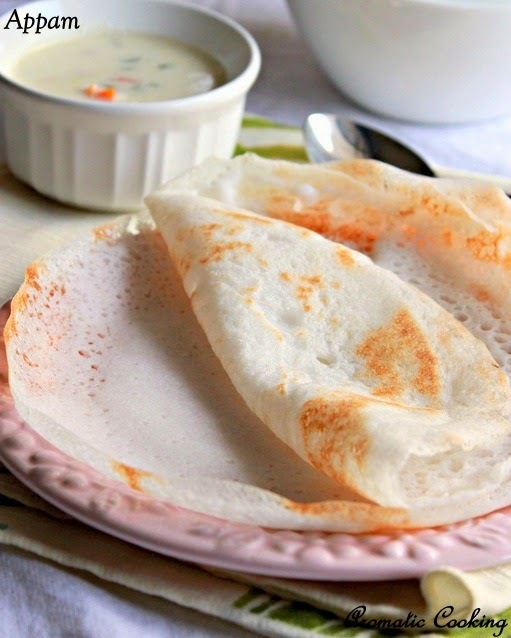 I love appam, nice recipe, I can try this recipe. I used ready made appam flour, which is available here in Indian stores. Delicious and lovely looking appam. Looks awesome. Soft and delicious aappams.. nice clicks..
New Year Wishes to You Hema! Hope you had a funfilled vacation, we too make Appam similar way with raw & idli rice...Appam looks so soft and yummy..perfectly done! appams mean pancakes? They look very inviting! very tempting appams!! perfectly made!! Happy New Year to you Hema. I hope you had a nice vacation in Dubai. I have fond memories of this wonderful city. Nice looking Appams!